This wonderful photo was rejected by Geograph because I did not know the photographer (120 years ago), although I have the original photo. So I'll have to show it here! 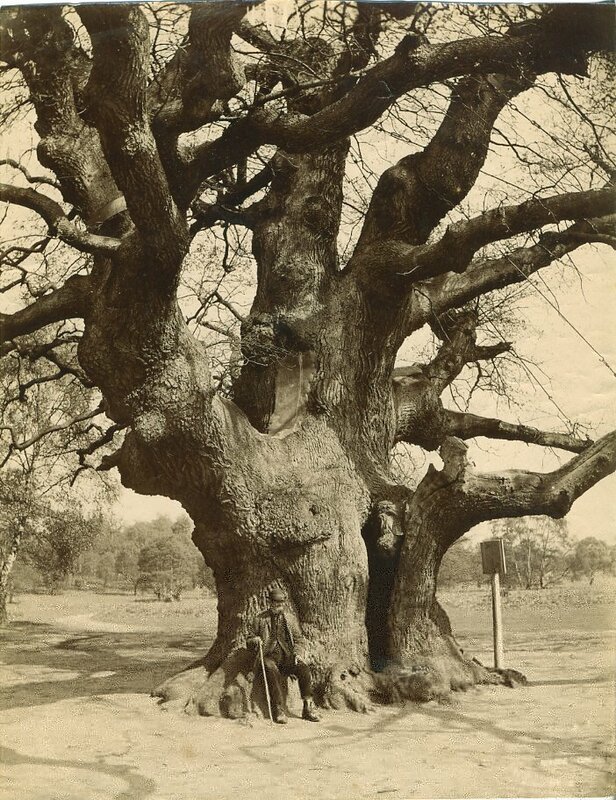 Perhaps England's most famous tree, this picture was taken about 1890 by an unknown photographer. Unlike today, the tree was then in a large open space. Thin cables with shackles held up the branches, which helps date the photo. Thoresby Estate owned the land around, and hired a 'guardian' to look after the tree, tell stories to visitors about Robin Hood, and accept tips from them. He always sat on a stump nestling among the roots of the big tree, the man in the picture may be the guardian. Soon after this photo, the Estate placed sheets of lead to protect against rotting of the biggest branches, but these were soon stolen by Robin Hoods of the time. Many more photos of the Major Oak can be seen on here. Most recent photo at top.